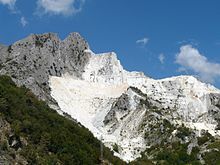 Carrara quarrel in Tuscany, Italy. A quarrel is a place frae that dimension stane, rock, construction aggregate, riprap, saund, graivel, or sclate haes been excavatit frae the grund. This page wis last eeditit on 18 Mairch 2018, at 07:40.